Enjoy a fun and magical night at Disneyland Resort after the parks close with this series of themed events that will run throughout the year. 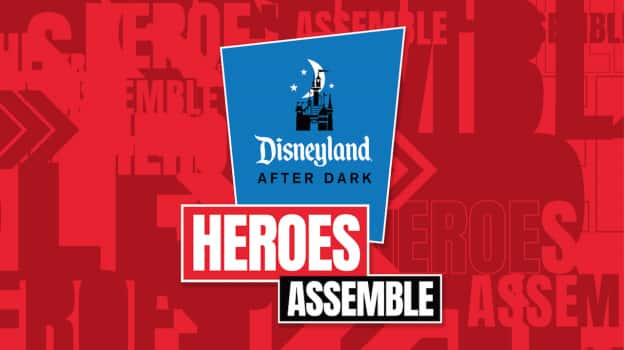 Disneyland After Dark is calling all heroes to unite at Disney California Adventure for two exciting Heroes Assemble Nite events. Guests can enjoy up to seven hours of fun at the park during these hard ticket events. Disneyland After Dark’s next events take place on April 30, 2019, and May 1, 2019 from 9 pm – 1 am. Guests attending will be able to enter Disney California Adventure as early as 6 pm. As part of the fun, costumes are encouraged but must follow Disneyland Resort’s guidelines. Tickets for these special events are $109 per person for guests ages 3 and older. Encounters with Marvel Super Heroes. Guests will enjoy live music throughout the park and are encouraged to join in the fun. Hold a loved one close for a sweet slow dance during Sweetheart’s Nite, or show off groovy moves at Disneyland’s 90’s Nite. Throughout the night guests will be able to enjoy some of their favorite attractions including, “it’s a small world,” Big Thunder Mountain Railroad, Matterhorn Bobsleds, Jungle Cruise and more! Guests will have all night to shop a fantastic selection of apparel, collectables, and other fun gifts. Special themed items will be available for each After Dark Event. As if these weren’t amazing enough, guests will also receive fantastic commemorative items. Sweetheart’s Nite: Souvenir lanyard, credential and event-specific guide map with each ticket as well as complimentary PhotoPass digital downloads during the event. 90’s Nite: Receive a commemorative fanny pack, themed guide map and complimentary Disney PhotoPass digital downloads with each ticket. Guests will be able to enjoy a variety of delicious, themed treats made especially for Disneyland After Dark.